Instead of a tip, we have some very exciting news: a brand new release of the Omega’s OS is available today! 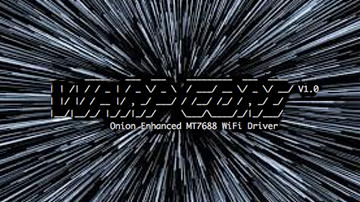 There’s a lot of goodies in this release, but we’re most excited about the WiFi Warp Core, Onion’s very own enhanced WiFi driver for the Omega2 platform. We’ll walk you through the some of the coolest new features and show you how to update our Omega to this latest release. Let’s dive in! All modern phones, tablets, laptops automatically connect to known WiFi networks as soon as they come into range without any intervention by the user. With the WiFi Warp Core, we bring this same seamless experience to IoT computers. The Omega holds a list of configured or saved networks, and the Warp Core takes care of the rest; connecting to known networks when they come into range (based on priority) and automatically reconnecting if there’s a network interruption. Overall, this feature frees the user from manually managing the WiFi connectivity of the device and provides a more stable and resilient WiFi connection. The list of configured networks can be updated and new networks can be added using the command line, using the browser-based Setup Wizard, or using the browser-based Onion Console. Continuing with our theme of WiFi connectivity with less user intervention, the WiFi Warp Core also takes care of detecting the specifics of a network’s security configuration. When adding a new network to the list of configured networks, all three tools (command line wifisetup tool, Setup Wizard, and Onion Console) use the Warp Core to automatically detect the network security (WPA2, WPA, WEP, or open), all the user has to do is enter the correct password. During the connection process, the Warp Core will detect the specifics of the network security (like the encryption ciphers: AES vs TKIP vs mixed) without any additional input from the user. As long as the password is correct, the connection will be established. It should also be noted that this feature brings support for WPA2 TKIP encrypted networks to the Omega2 platform. That’s right, we have more WiFi features to tell you about! The Warp Core allows the Omega2 to connect to hidden WiFi networks (networks that do not broadcast their SSID). This will add the network to the list of configured networks and the Warp Core will take care of the rest! We’ve also spent some time working to alleviate the low transfer and data corruption issues on SPI transfers that some users have experienced. We’ve surmised that these issues are due to a hardware limitation of a component used in the Omega and were brought to light by how the SPI kernel driver uses the hardware. Based on this, we’ve identified a kernel driver workaround that, while it cannot fix the limitation, significantly improves the performance of SPI transfers. After passing through a gauntlet of validation on our end, the kernel driver update has been included in the new OS release, so you’ll be free to experiment with the SPI performance gains on your own device! We’ve also added the Python spidev module to our package repo. With spidev, you’ll be able to write userspace Python programs that that interface with SPI devices. See the GitHub repo for module usage instructions and an example script. Make sure to note that this is the latest release, and not the stable release. As such, proceed with care which brings us to the next section. If you find any odd behavior, are having issues, or want to give us some feedback on the new release, please post on our Community Forum. We value all of your responses, good and bad, at the end of the day, we want to make an amazing product and can only do so with your help.